It is time for the emperor’s annual trip through the garden, and you are determined this year to paint the best portrait of him. Of course, this will mean a small invasion of his personal space, but if he doesn’t know, it won’t hurt. Unfortunately, your fellow painters are clumsy oafs with clomping feet and are sure to alert the emperor to your presence. But with a little skill (and possibly a few nudges and pushes), you are convinced that your portrait will be the best this year. As long as you aren’t too disgraced in the process. 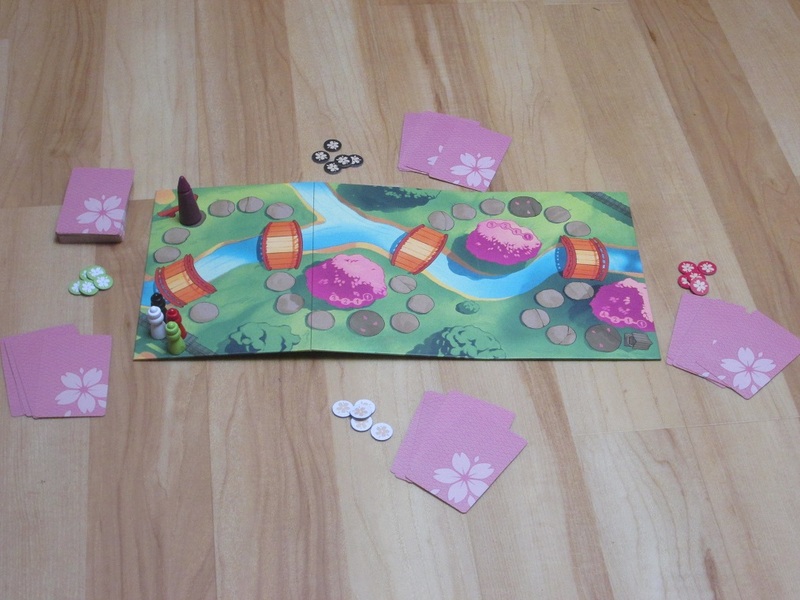 Sakura is a simultaneous action selection/hand management game for two to six players. Players are painters who want to be close to the emperor when he smells the cherry blossoms but not so close as to cause their own disgrace. The player with the most points after the emperor stops three times is the winner. Sakura set up for four players. 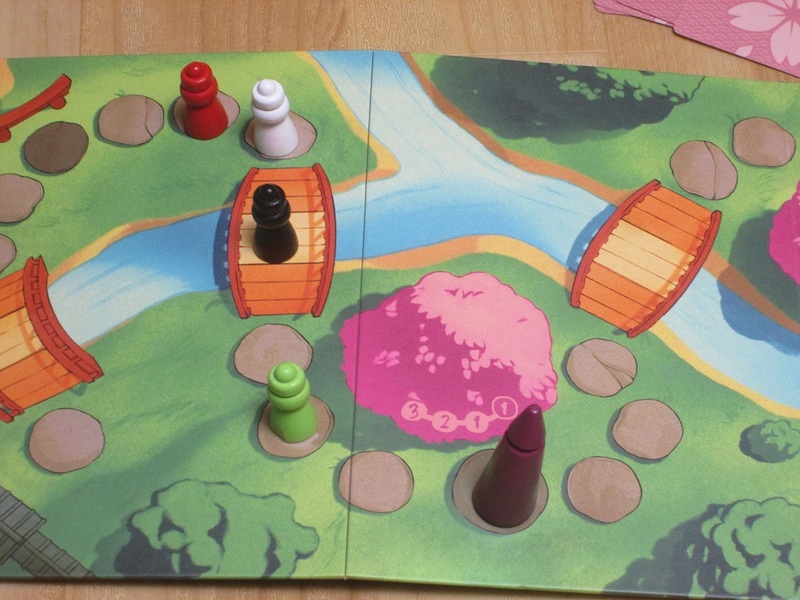 To begin, players place the game board within reach, and each player receives a painter and the five starting points of a color. The cards are shuffled, and each player receives a starting hand of five. The game begins. Each round, players will secretly and simultaneously choose one of their hand cards to play. Each card has an initiative number, a garden action, and a player action. Once all players have chosen a card, cards are revealed, and they activate in initiative order. When a card activates, the garden action happens first. The garden action usually moves the emperor either forward or backward, although it can also move the player closest to the emperor or the player farthest away. Then the player action happens, which moves the player forward or backward a set number of spaces or moves the player based on the board state. Once all cards have been activated, the cards are discarded, and players receive new cards. A new round begins. Play stops whenever the emperor first reaches one of the three scoring spaces. The card that moved the emperor onto that spot is fully carried out (including the player action), and any remaining cards played that round are discarded. Points are awarded to players based on their position relative to the emperor. The players all move up into a contiguous line, and play continues. Once the emperor reaches the third and final scoring space, points are awarded, and whoever has the most points wins. As I was explaining Sakura before playing it for the first time, one of my fellow players said, “So it’s like RoboRally.” I immediately balked at this because RoboRally is a game I don’t particularly enjoy, and Sakura looked fun. “No, no, no–just listen,” I said and went on with the explanation. At the end of the game, a couple of the players said, “This is a little like RoboRally.” And I had to agree with them. If forced to boil Sakura down to a short slogan, I would say Sakura is RoboRally without the rules overhead. And it turns out, this is a really fun proposition. 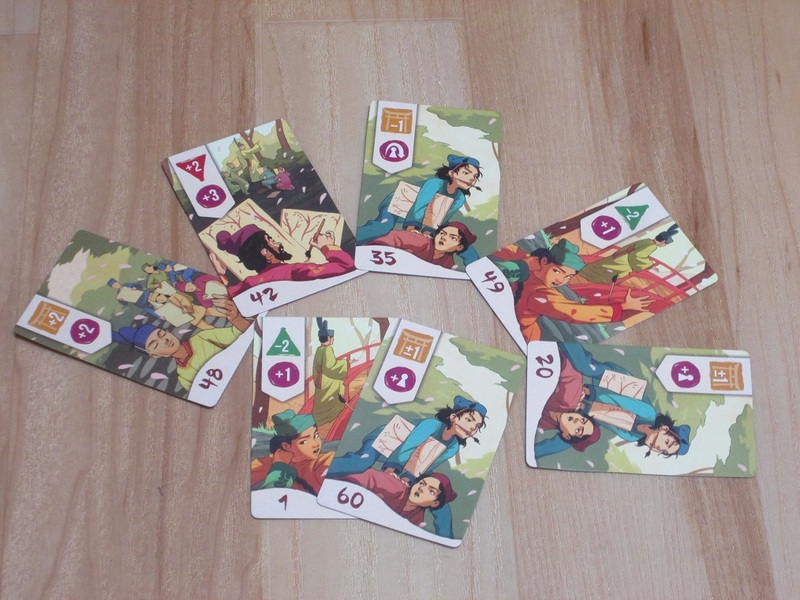 Sakura is based on a super simple premise: each round, players will secretly and simultaneously play one card from their hand, flip them all face up, and activate them in initiative order. Each card consists of a “garden action,” which usually moves the emperor, and a player action. All of these steps are simple. And that’s where the spark comes in. Much of the fun of Sakura is in launching your friends into the emperor (or vice versa), or playing a card that unintentionally throws yourself into disgrace. Back to RoboRally: I find RoboRally frustrating for a number of reasons, but there are two main ones. The first is that it goes on too long for what it is. The second reason is I have to plan several cards, limited by what’s in my hand, only to see every last one of them shot to bits. You have the illusion of a grander plan but ultimately end up where you don’t want to be. In Sakura, you end up in the same place; you just expended less effort to get there. And it turns out, this simplicity gives players just the right amount of investment to make their lack of control work. It’s funny to see players make plans to maneuver their painters into position, only to see these plans go hilariously awry. 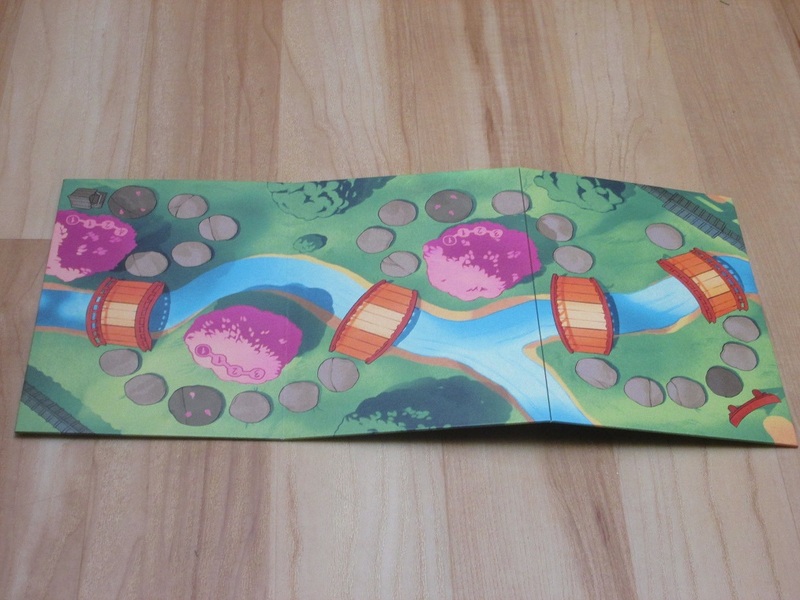 And while this is a Reiner Knizia game, where usually the criticism is “theme need not apply,” there is a compelling story behind what you’re doing. Granted, this story is sparse, but it provides just enough framing for the action to make it funny when a player launches into the emperor’s backside. It makes sense that an over-eager painter would lose points in disgrace, and it’s this press-your-luck challenge–you want to be close, but not too close–that gives the game its grounding and makes it worth playing. When the emperor lands on a scoring space, players score points for where they stand in relation to the emperor. There are also lots of clever subtleties in the way the game works. For one thing, the cards with the lowest initiative (which will activate first) don’t move the emperor much, just one space in either direction, or they move the painter closest/farthest from the emperor. The card with the 1 initiative, guaranteed to go first, doesn’t move the emperor at all. This can keep players who draw the lowest-numbered cards from impacting scoring too much before the other players’ cards activate, evening some of the luck of the draw inherent in the system. While counting cards is difficult, players who are paying attention can keep track of what number clusters might be available, so as the game draws on, savvy players will be better able to predict when their cards will fire. The game is still tactical, but these and other subtleties keep it from seeming unfair. The cards in Sakura. I like the illustrations on them. Also, they are easy to understand and well balanced. No one is pretending that Sakura is a deep strategy game, or even a strategy game at all. All players have the same goal–to be the closest to the emperor when he reaches the cherry blossoms. All players reach their goal in the same way–by playing the right cards. Sakura falls squarely into the tactical game category, only players have less actionable knowledge than in some other tactical games, like, say, Libertalia, where you can know with certainty the exact cards available to another player, even if you can’t know with certainty which card that player will play, or even Gravwell, in which you know half the cards in the other players’ hands. This is bound to frustrate some players. For me, this isn’t a bother for a couple of reasons. One, the cards in Sakura are subtle variations on one another and provide just enough of a difference to be interesting but not enough of a difference that you can’t plan for them. The variance is pretty simple: the emperor can never move forward more than two spaces, never backward more than one, and the other cards will only affect the player in the front or the back. The larger variance comes in how much the individual players will move, and while being a tactical game, Sakura also contains an element of pushing your luck. You can play cards that will move you great distances…you just have to be prepared that these have a greater chance of misfiring. So it’s not fully random. 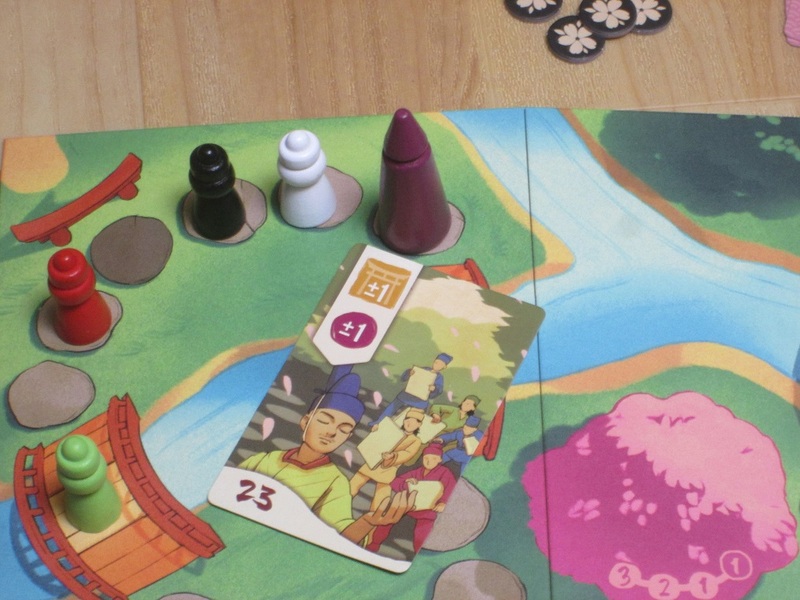 Like many Knizia games, Sakura involves risk management. And two, Sakura is short and lighthearted enough–and there are plenty of laughs and schadenfreude to go around–that it’s hard to become too upset when you run into the emperor. It’s hilarious to think of upstart painters rushing into their own disgrace, and at least in my groups, there haven’t been excessive sour grapes. This isn’t the kind of game I want to play all the time–players don’t have a lot of room to feel clever (it’s more the satisfaction of having a risky gambit pays off)–but Sakura is one of the best simultaneous action selection jockeying games because it’s short and simple in all the right ways, putting the focus squarely on the laughter inherent in the vicissitudes of fortune. The Sakura board does not lie completely flat. A shame. The components in Sakura are by turns beautiful and a little upsetting. The artwork on the cards, the setting, the pawns–all of this is well done. However, the board doesn’t lie flat, meaning the emperor is often climbing mountains or descending into valleys, and his top-heavy wooden figure is often less graceful than one would expect of the emperor. You can weigh the board down with a phone during play, but that destroys the aesthetic somewhat. The cards look nice and feel nice…until you try to separate them from each other. The cards have a matte finish that often causes them to stick together (although this gets better once the cards are broken in some). The insert is nice and provides a well for everything, and I love the one-piece box; however, the point tokens rarely stay put in transit, meaning you’re probably better off with a plastic baggy anyway. Also, I wish the point tokens had all been one color. Because there are tokens matching the player colors, you feel obligated to pass them out, even though this really doesn’t matter. The insert. I love the way Osprey Games boxes open. The box says the game will take between twenty and forty minutes, and that’s pretty accurate (the higher estimate is for more players or more aggressive players who constantly send the emperor backward to punish their confederates). The box advertises play for two to six players. I’ve played it with two, three, and five. I played the regular two-player variant, and while it worked fine, I didn’t find this satisfying. With just one other player, it was still okay, but there was nowhere near the energy needed to make this game delightful. However, with fewer players, players do have more control over their fate as there are fewer cards to get in the way each round. Since this is a game without a lot of forward planning, I’m okay with a higher player count here, and I think the ideal range is probably four to five. I wouldn’t refuse six or three; with two, there are so many other, better options that I wouldn’t choose this. 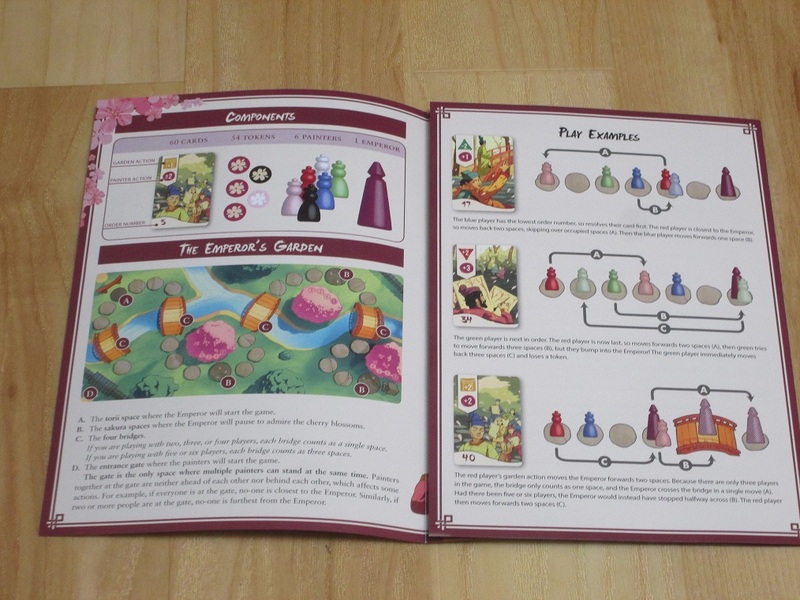 The rules leaflet is well illustrated and easy to understand. The rules for the game are simple. 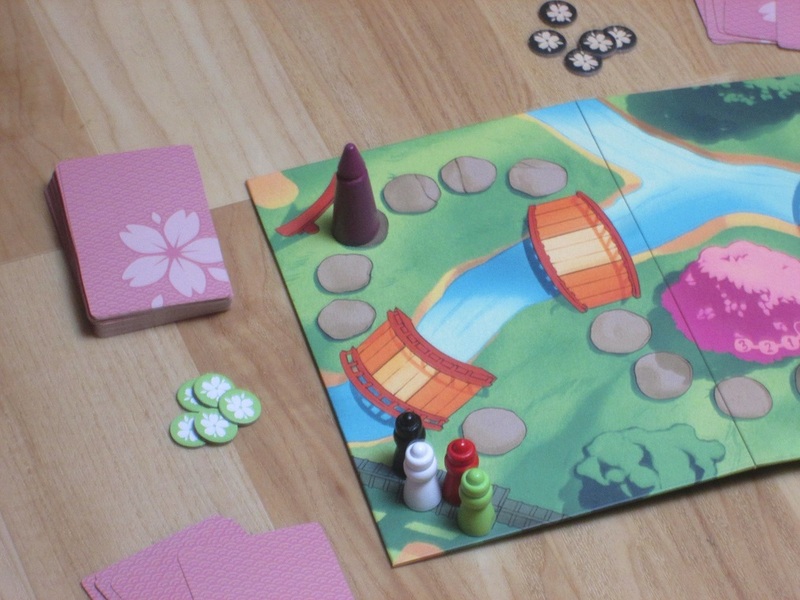 Sakura is a light simultaneous action selection game with lots of room for laughs and player interaction. It doesn’t have much in the way of strategy, but it also doesn’t have much to remember in the way of rules, so players can step right into the fun. 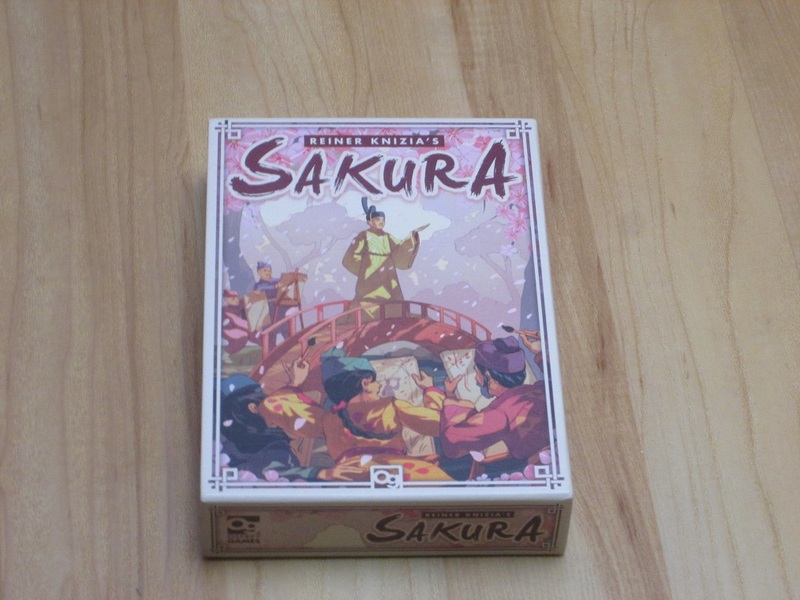 Sakura probably isn’t destined to be remembered as one of Knizia’s “great” games, but like so many of his small-box games, it’s very good at what it does, and it’s consistently enjoyable to a wide range of audiences. This probably won’t be my filler pick in every circumstance, but when the group can handle a little mayhem and doesn’t feel like a brain drain, Sakura is a great choice. 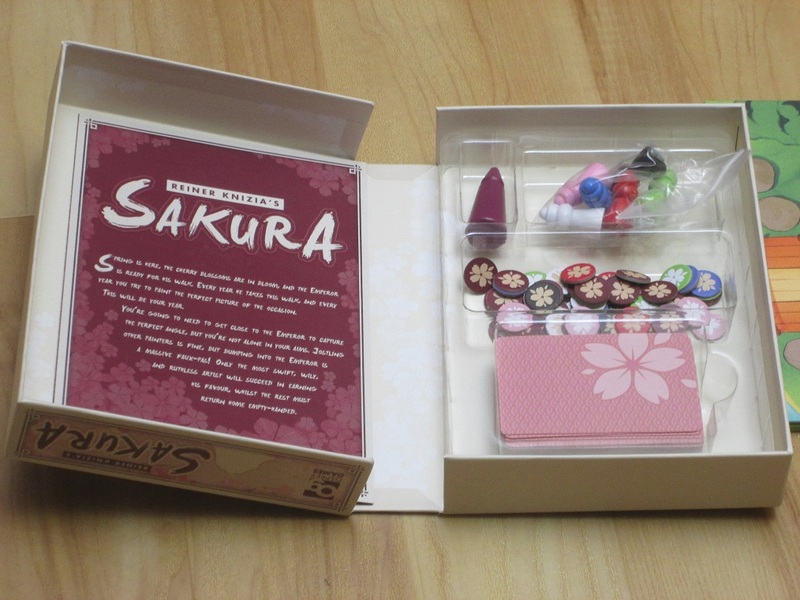 iSlaytheDragon would like to thank Osprey Games for providing us with a copy of Sakura for review.